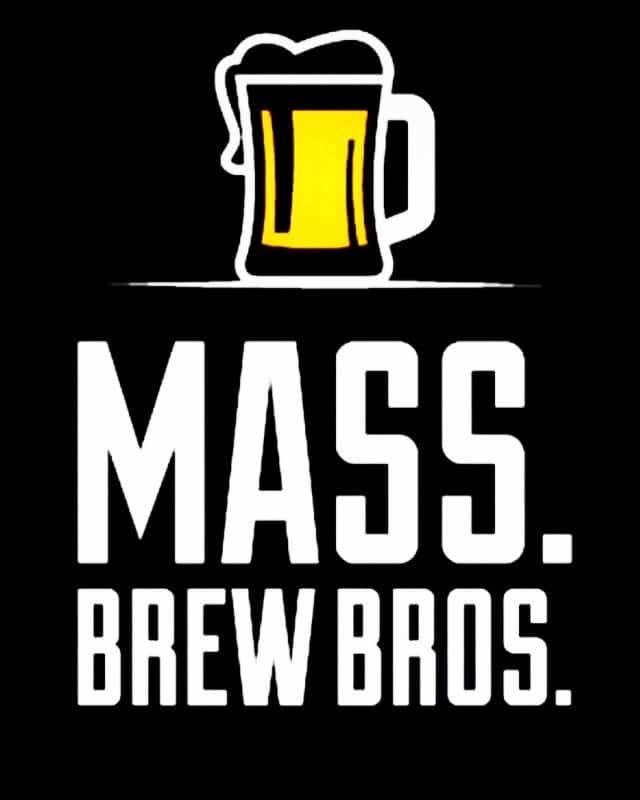 Organized by the Mass Brew Bros., this is part three in a series called “So You Want to Start A Craft Brewery?” Five articles, each written by a different blogger, profile a local brewery in planning, followed by a culminating story that explains what the authors have learned about the challenges of opening a brewery in Massachusetts. 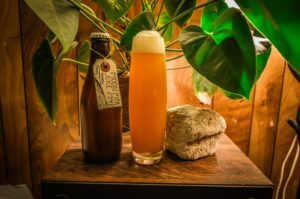 At a time when craft beer is all the rage and an entire generation of young beer lovers is constantly seeking out new local breweries, it has become a larger than life undertaking to throw one’s passion and product into the mix. 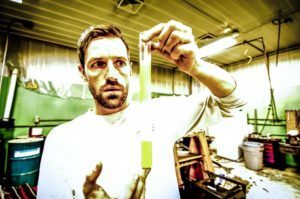 In an effort to better understand what drives homebrewers to consider making the leap from dedicated hobby to full-blown career, and to get a sense of the challenges the transition entails, I sat down (over beers, naturally) with one of the co-founders of brewery-in-planning SpaceLab Beer. Mike Plassman, co-founder at SpaceLab Beer Co., at work in their current homebrew setup. The duo of talented home brewers are currently jousting full-tilt against the many obstacles that stand in the way of their dream to open a commercial brewery. I was introduced to their beer thanks to a blind tasting event held by the Mass. Brew Bros., in which the ubiquitous New England IPA was the featured style. Our panel of beer fanatics tasted nine different beers, and against the likes of famed haze-slingers including Tree House and Trillium, a little bottle of homebrew stood out! It was a soft, juicy, well-executed beer that many of us felt certain had come from one of the heavy hitters. The name SpaceLab was immediately on everyone’s radar. Who were these homebrewers, and what planet did they come from? Laidback, and generous with his time, co-founder Mike Plassmann loves talking about beer. He started brewing at age eighteen when he happened upon a Mr. Beer Kit near a 7-11 store in his hometown. “The beer found me,” he jokingly puts it. The fateful find was followed by five-plus years of on-and-off brewing before he decided to “start making beer that people actually enjoyed.” His efforts took a more serious turn when he entered what he describes as a “backyard brewing contest” in the Salem Willows. The beer contained a slew of hyper-local hops (all grown in his backyard) and represented his first ever attempt at an NE IPA. He called the beer Pond Water, and it made a big impression – especially with the friend of another avid homebrewer in attendance, Jim Wilson. For now, SpaceLab’s homebrew set up is located in Rowley, at the home of co-founder Jim Wilson, seen here measuring original gravity on one of their experimental brews. A fellow brewer who had been experimenting for years in hopes of one day opening his own brewery, Jim turned out to be his future co-founder. Since the collaboration more than two years ago, the dream of opening a commercial brewery has slowly started to take shape. They hold each another accountable, learn from one another, experiment constantly, and brew like beasts – to the point where they feel very confident about their current core lineup of beers, and are excited to share some of their experimental offerings as well. It was this collaborative relationship that ultimately led them to agree on the name SpaceLab, which started with Mike’s fascination in the cosmos. A self-admitted science nerd who argues that it’s hard not to be astounded by the marvel of the universe, he pitched the idea to Jim after many previous attempts to find a name they could agree on. Jim was sold. 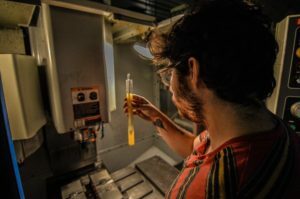 “I loved it,” he told his brewing partner, “it expresses our passion for infinite experimentation.” True to the core of SpaceLab is the desire to experiment, test, and perfect. Mike and Jim have been actively seeking a brewery location for the better part of ten months, a process which one can imagine is not easy. They have searched in several towns along the North Shore including Peabody, Beverly, Salem, and Gloucester. One example of the many obstacles facing home brewers looking to transition into the commercial realm is that of legal language. In this case, Peabody, Mike’s home town, and supportive of his desire to open a brewery, requires a special permit because they don’t currently have zoning for breweries. Permission is allowed only by the City Council. The uncertainties and red tape of such requirements can make finding the right location a time-consuming and frustrating pursuit. Though SpaceLab’s quest for a commercial brewery may sometimes seem light years away, the ship’s commanders remain incredibly positive. Jim has continued to hone his craft, gaining valuable experience as a cellar man for a local brewery, while Mike perfects his own brewing, attends local business events, and hunts for their future home. 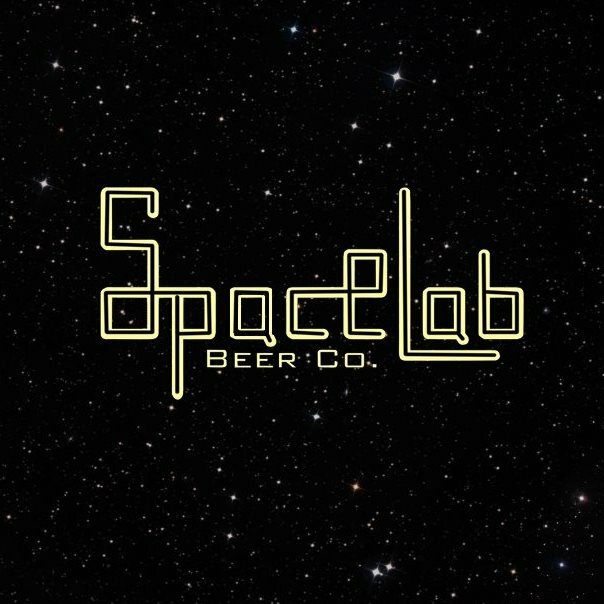 Such infinite commitment means that SpaceLab will be ready to execute its mission when it does find a home in the craft beer solar system.